Power has become commoditized as there are regulating entities who manage the grid and there is no difference in the quality of the product or basic electricity services. Additionally, the timing of delivery and security of supply have become stable. This means that price differences between suppliers are limited as service providers cannot distinguish themselves with better quality or service levels. As a result you’re able to mainly focus on the “Retail Adder” pricing aspect during your comparison of suppliers. But how is an electricity price built up? Not all components of the “Retail Adder” are negotiable: transmission, distribution, credits, reliability mechanisms, and taxes aren’t while capacity is set during auctions. Supplier Margin is the most negotiable cost component, and one E&C focuses on minimizing during the competitive bidding process. Typically, the capacity auctions set prices for 2-4 years into the future. The prices set during the auctions are those which a customer will be quoted by suppliers. The only other option is to pass through the capacity in case changes to regional dynamics are expected in the coming years. One of the sources to verify capacity charges is www.snl.com. The good news is that there are some negotiable prices which can be managed. 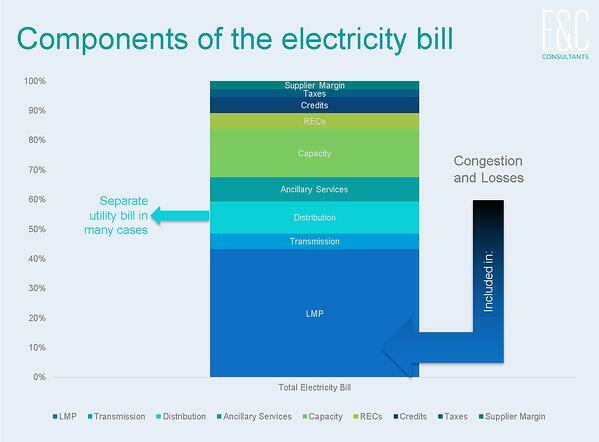 As you can see in the preceding image, the biggest chunk of the electricity supply bill is the “LMP” or “LBMB”, the Location Based Marginal Price. On average this part accounts for 40% of your total price (Supply + Utility). The prices quoted by suppliers to an end-user will not be the same as suppliers source power from different generators and some suppliers even own generating assets. In the RFP stage it is important to focus on this component to determine which supplier has the best sourcing and generation assets. End-users can request to see the sourcing profiles from the supplier trading desks when quotations are submitted. However, a lot of the energy suppliers guard this information as they consider it to be confidential from a strategic and competitive point of view. "Location” also implies price differences based on the physical position of your connection point. The level depends on the “node” your facility is closest to. It varies because losses and congestion also differ depending on the circumstances such as distance, quality of the infrastructure, and weather conditions (warmer weather causes power lines to expand and therefore elongates the distance power must travel). Average line losses in the US are at 6.5%. Usually an energy supplier will charge this rate and then do a check-up every quarter to pay back any surpluses or charge shortages. However, the line losses can be negotiated. You could for example ask the supplier to set this percentage according to the line losses the past couple of months specific for your region. Some suppliers allow these losses to be fixed for the duration of the contract term but most of them do not, simply because there is no clear way to measure future losses. If a supplier sets a fixed price it will most likely be set higher than the 6.5%. The supplier will probably take the maximum line losses of a past period and will put a premium on top to make sure they’re covered against any risk. Conclusion: you’ll end up better with the quarterly check-up. The next part of the retail adder is ancillary services, an add-on for grid reliability. 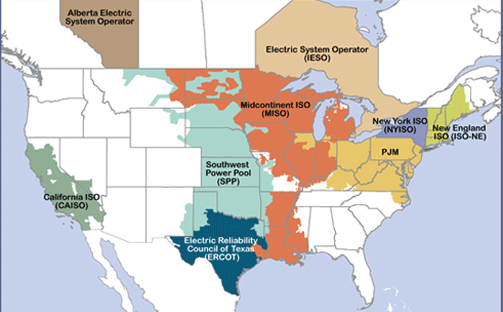 Ancillary services providers are generators with excess capacity that can be dispatched to help balance supply and demand, regulate voltage, and start the grid after a blackout. These ancillary services are bid on during auctions which set rates in the futures market. However, they are also traded in the day-ahead and real-time markets. Therefore, flexible contracts can be set up in different ways. Ancillaries can be completely fixed, completely indexed to day-ahead/real-time, or a percentage can be set on each of the three markets. Depending on the types of generators in your area the pricing can be more advantageous one way or another. If ancillary services come from coal plants it’s cheaper (Ohio is a state dominated by coal power generation) than gas (New York). The most negotiable part of the electricity fees is the supplier margin. E&C asks full disclosure of the supplier management fee on power RFPs so we can clearly identify suppliers who are charging premiums on their fees. The last component to be discussed is the Renewable Portfolio Standard “RPS” which is semi-negotiable. The suppliers are obligated to include a certain percentage of renewables in their power supply mix depending on state-level legislation. The end user can also choose to buy their own renewable energy credits “RECs”. These rights are traded on a transparent marketplace, so there is a daily price. However, it is hard to beat the prices that suppliers can provide because they have access to RECs coming from utility scale generators. Additionally, some suppliers may have already purchased cheap or expensive vintages of RECs, so these prices should be checked against the relevant REC market. If your supplier is beneath the market bid on those RPS obligations, then you may be getting a great deal. Conversely, bad trades in the REC market could be avoided by making the supplier take RECs from the spot market. As mentioned during the introduction of this blog article, power became commoditized as the basic services are the same, but this doesn’t mean that the cheapest electricity contract is the best option. The optimal electricity contract should be defined based on your company’s needs. How do the energy costs relate to the total cost of your product? Can energy expenses be passed through? The answer to these questions can help you to define the ideal contract type. In general, there are four types of contracts in the US. The first one is a contract with a regulated tariff. 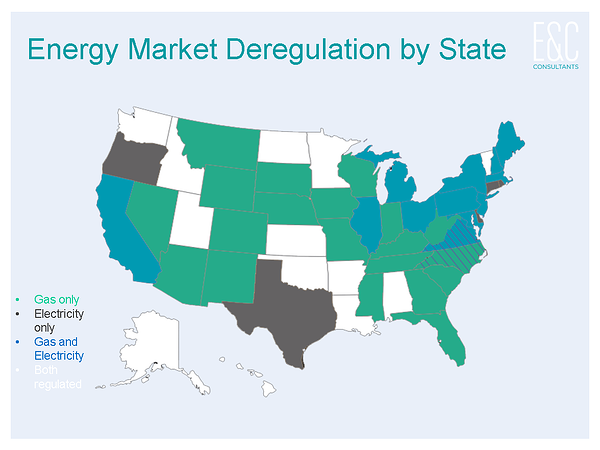 It might surprise you, but out of 50 states only 13 are 100% deregulated (both for gas and electricity). However, in a lot of these states either one of the commodities is deregulated or there’s some room for maneuver. In a deregulated market the least advanced contract is a fixed price contract. As there is only one hedge to be done, you can barely apply risk management. Typically, these contracts are reserved for facilities with small consumption and spend. Luckily, there are two types of active management products as soon as your company has significant usage. Block and indexed contracts where you will lock capacity blocks at opportune moments. Load following block and index contracts where you will purchase in percentages of your annual consumption. These types of contracts all have different conditions. You can read about them in detail in our white paper on energy contract types. The internet is full of negotiation tactics such as the salami technique. But whatever tactic you use, communication is key! To start with, who will you communicate with? There’s lots of energy suppliers in the US such as Constellation, Engie Resources, NRG and many more. With how many parties will you negotiate? The most difficult part is not how many offers to compare but rather making sure you’re not comparing apples to oranges. Be clear about deadlines to receive offers so you can compare offers that take the same market situation into account. What will you ask them for? Strike the right balance between asking for a specific product and keeping your options open because on the one hand you want to prevent receiving a wide variety of products which makes it impossible to compare, but on the other hand there could already be a standard contract out there that matches the needs of your contract much better than the product you are currently thinking about. As well, too many “special requirements” may decrease supplier participation or cause suppliers to add a premium to their offers. Are you sure you need to ask for volume conditions right away for example? Concessions are much easier to achieve in a piece-by-piece manner… Don’t forget, negotiations come in rounds and credibility is key (for both sides!). As well, in order to have energy suppliers offer their best possible proposal they should have a proper overview of the current energy situation and possible future projects. Necessary information on when you will consume how much energy, starting date of the offers, expected contract duration, expected consumption etc. Power markets are complex and setting up a supply contract to meet your needs may seem daunting. However, if you consider the market fundamentals and demand transparency from the bidding suppliers, the general regional prices will become clear. Be sure to ask suppliers to break out their “Retail Adder” pricing into the individual pricing components – this will highlight any hidden premiums from supplier to supplier. Additionally, pay close attention to the LMP bids during the RFP to see which suppliers have a competitive advantage in generation sourcing. You will certainly see differences in both the “Retail Adder” and LMP quotations, so be sure to ask suppliers why there is a deviation. This added level of transparency will not only force suppliers to be honest, but it will also help you decipher which pricing components are volatile and which are stable. This better understanding of the market dynamics influencing your regional electricity prices will allow you to make an educated decision about which components should be fixed and which are candidates to pass through. Kolya is the senior consultant for the US & Canada. Given his time zone, he also is involved in coordinating for the Mexican markets. Kolya also manages communication between US & European teams if the company contact person is in North American time zones.